Have I mentioned that I love cheese? LOVE it. Sometimes I want a certain kind of cheese and it inspires the entire meal. One night last week it was feta cheese. I like it plain. I like it in salads. I like it in pasta dishes. Now I even like it with sauteed chicken. This is not my picture. I borrowed it. I promise I will give it back. Eventually. Sometimes I buy it in blocks like this pic – often from the Ballard Cheese people (No, I don’t know them – I just love their cheese). Other times I just buy whatever is convenient – like the pre-crumbled Athenos brand that most grocery stores carry. So last week I decided to make chicken with feta and basil from our garden. So stinkin’ simple. I simply sauteed frozen, unbreaded chicken tenders (we always keep a bag of unbreaded chicken tenders in our freezer. They are much more versatile than frozen breasts!) in butter & olive oil and added some garlic, salt & pepper, and minced up basil leaves. I sauteed at medium heat with a covered lid – to keep it juicy – and then for the last 10 minutes or so left the lid off and added some Greek vinaigrette marinade/dressing to the pan. Once it was cooked I crumbled feta over the top and then put the lid back on and let it rest a bit while we finished the rest of the food prep. My husband, Eric, has been on a white bean dip streak. He made hummus the previous week but felt the consistency was very thick and the garbanzo beans are harder to work through the food processor. This time he tried plain white beans called Cannellini beans. He mixed the beans, olive oil, minced garlic (real garlic cloves he cut up. Gotta keep fresh garlic on hand. ), lemon juice and minced basil to a yummy deliciousness in the food processor. (Try to get most of the lumps out!) Eric thought the consistency was a little too runny, but I thought it was fine and the taste was fab. Then he warmed some pita bread on the stove and cut it into triangles for dipping. But we also wanted more. Just . . . more. Then we realized we had a baguette we needed to use. It was the crusty, thin kind – just the absolute best for making crostini. So I sliced a bunch of thin ovals and covered them with butter. Generally speaking, I like to use a spray bottle of olive oil for this purpose – but our bottle is on the fritz and, honestly, the butter gives a better flavor than the olive oil. Maybe the olive oil is better health-wise than the butter, but in flavor YOU CAN’T BEAT BUTTER. Then I arranged the bread rounds on a cookie sheet and threw them under the broiler until they were a golden brown. I had pulled out some cream cheese to soften so I just took this Spinach & Herb dip mix I had on hand and mixed a whole bunch of it into the cream cheese to top the Crostini. NOTE: In the interest of full disclosure I should mention that I just signed up to be a consultant for Tastefully Simple – where I got this Spinach & Herb dip mix – but I also want to be clear that I’ve been using this stuff for about a year so this is not a fly by night, promoting my new product, kind of thing. My bottle of the Spinach & Herb mix is almost empty due to repeated use. 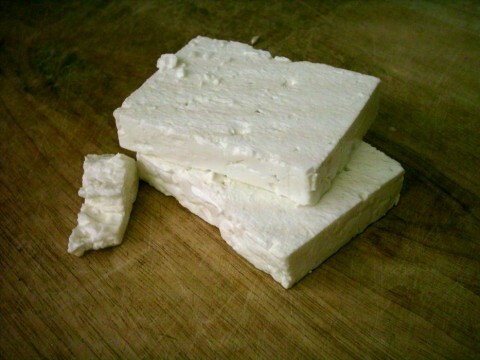 I use it in cream cheese for Crostini (as I’m discussing here), on/in scrambled eggs, in dip mixes with sour cream, or mayo and sour cream, or mayo and Greek plain yogurt, or in seasoning steamed, buttered veggies. It’s one of the more versatile seasonings in my spice cupboard. Then I spread the spinach herb cream cheese mix on the golden brown Crostini and DONE. Incidentally, I also served this exact same Crostini as an appetizer for a dinner we hosted a couple weeks ago and everyone just loved it. So here was the end result of our meal. In hindsight, a salad or some steamed zucchini or broccoli would have been fabulous to offset the starchiness – but at the time we didn’t have those on hand. It was soooooo good though. Yummy. I had never made chicken with feta before but I see us doing that again sometime soon. Had I known you were going to take a picture of this meal, I would have tried to make some food from a different color family. I know! That’s why I mentioned that a salad or other veggies would have been a welcome addition.